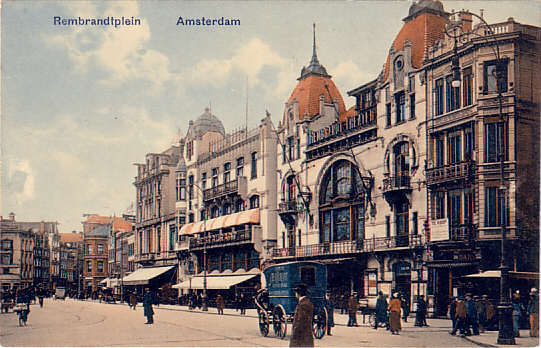 Built 1902 by Evert Bremann and W. Molenbroek as a revue and operetta theatre. Named in honour of the Dutch painter, Rembrandt Harmenszoon van Rijn (1606-1669). Opened 16 Sep 1902 with a festive gala. From 1902 until 1919, primarily used for German and Viennese operettas, from 1914 also by Dutch operetta companies. Converted to a cinema in 1919, re-opened on 12 Sep 1919. 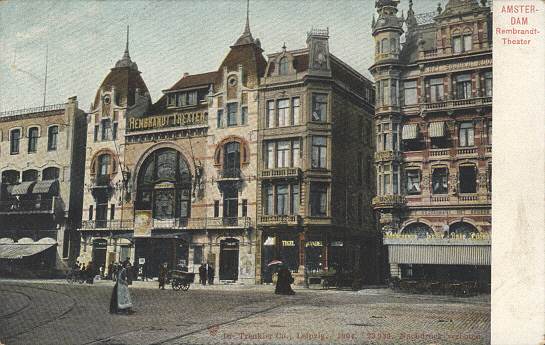 Demolished in 1937 in favour of a new cinema building of the same name, see Amsterdam: Rembrandt Theater (new). Front Text: "Amsterdam, Rembrandt-Theater", inscription: "Rembrandt Theater"
Front Text: "Rembrandtplein Amsterdam", inscription: "Rembrandt Theater"